Cutting-edge 1200cc sportsbike takes shape with 650 twin to follow. Taking cues from the TT bike, this Norton image shows the V4 that's set to debut at Motorcycle Live. Norton shared its CAD images for the 1200 with MCN. Norton's CEO Stuart Garner has just released a video teaser for their new V4 road bike. Yes. Get. Excited. Norton’s stunning seventh place in this year’s Superbike TT has accelerated progress on their new 1200 V4 superbike, which is now in the final stages of development. Work has been gaining pace at the Donington factory and the state-of-the-art superbike is now expected to be unveiled during Motorcycle Live at the NEC in Birmingham, at the end of November. Norton have steadily increased sales and production since moving premises from an industrial unit in the grounds of the Donington Park circuit to a facility within the grounds of Donington Hall – a former stately home that has been converted into a plush hotel by Norton owner Stuart Garner. But until now, the range has been centred around the Commando model and various limited-editions using tuned versions of the same 961cc parallel-twin engine. With prices starting at £14,495 for the Commando Sport, and rising to £26,000 for the Domiracer, the business model of small volumes at premium prices ensures a decent cash flow. And the new V4 won’t be cheap either. The base model is expected to cost around £28,000, while a run of 200 limited-edition V4 1200s will each sell for around £40,000. The limited edition will be available as two versions. One will be a race replica, featuring chrome painted carbon with forged wheels (see main picture, right) while the other version will have exposed carbon bodywork, a carbon fuel tank and BST carbon wheels. The high-end sportsbike is heavily based on the company’s TT racer and will feature a 72° V4 layout. Garner explained: “We went for 1200cc rather than 1000cc as we feel modern technology enables us to get the performance we want without compromising on weight or handling. And because we are not planning to race this bike, it doesn’t matter if it’s over 1000cc. The chassis will be made from aerospace-grade billet aluminium and the top-of-the-range superbike will boast Öhlins suspension and carbon wheels built by South African firm BST. And the machine will be bristling with top-notch technology, including launch control, traction control, anti-wheelie, an auto blipper and adjustable engine braking control. Norton are also still considering the fitment of semi-active suspension. The bike will have Road and Race modes with data-logging functions that will display lean angles, lap times and more. And instead of mirrors there will be rear-facing cameras that project an image of what’s going on behind on to a full-colour HD screen on the dash. The limited-edition machines will also come with a full, titanium race exhaust alongside the road-legal item found on the base model. And while the base model is expected to cost under £30k it won’t be watered-down in its performance. It’s expected to feature a cast frame and swingarm, rather than the billet/hand-polished versions on the limited-edition, and some of the controls and levers will also be slightly downgraded. Work on the top-end new V4 model is under way now and bikes will be delivered in June/July 2017. The focus will then shift to the standard model, and onto an all-new Norton 650. Garner says the 650 twin will be unveiled in November 2017 and go on sale the following year. And while this bike may not have the headline-grabbing stats of the V4, it should be a very capable middleweight. Both the 1200 and 650 have been designed in conjunction with world renowned engine designers Ricardo. Norton are also working to ensure the current Commando range meets new Euro4 regs that come into force next year. Garner explained: “We want to continue with the Commando as it is a great bike that is selling well. If we keep the Commando, then add the V4 1200 and the 650 we should end up with three engine platforms and eight or nine different models. Taking cues from the TT bike, this Norton image shows the V4 that's set to debut at Motorcycle Live. 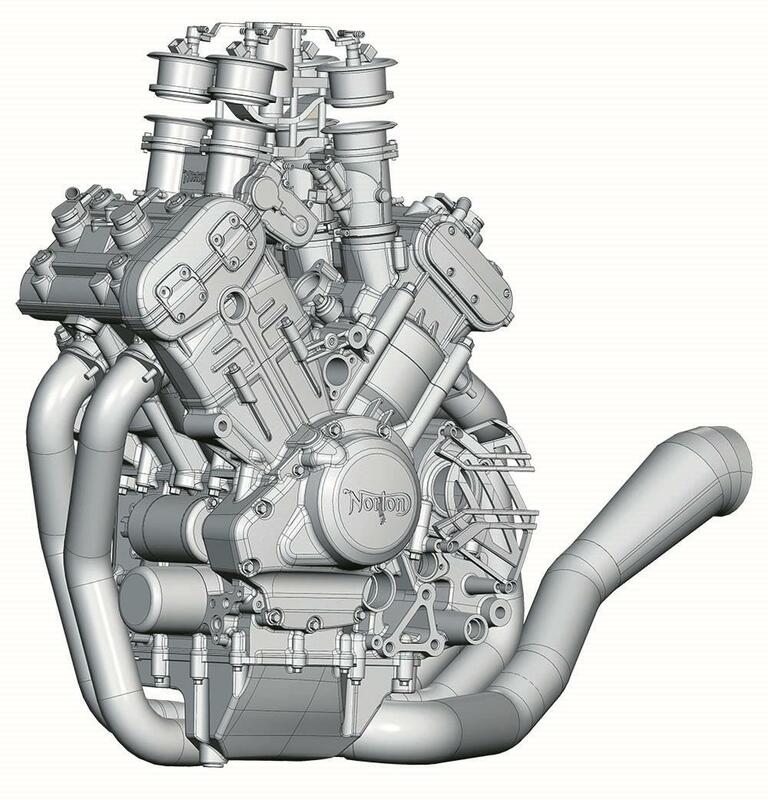 Norton's 72 degree V4 has been developed with help from Ricardo Norton shared its CAD images for the 1200 with MCN. Norton shared its CAD images for the 1200 with MCN.